Is there such a thing as death by spazzing out over statistics? If so, I'm probably in the danger zone by now ;-/ Anybody care to explain Least Squares Means to me? Yijk = µ + αi + βj + αi x βj + eijk - I thought I'd take a break and make a start on the maca series. I first learned about maca back in 2003, when I became involved in the bottling and encapsulation of it. The owner of the maca company was one of those 'looks too healthy to be real' types and his story was that, after years of debilitating chronic fatigue syndrome, he found maca and never looked back. Maca is a root vegetable, a bit like a turnip, and it comes in a range of colours. There is a lot to be said about the various types/genus of maca, growing altitudes, processing methods (these things all affect its potency) and documented biological effects. I'll post about all that in the near future, with the tag: maca series, but today I wanted to give you the nutritional stats. For some reason, in spite of maca holding sway as some kind of natural health wunderkind for years, it does not seem to appear as an item in any food logging sites or software. I say 'seem' because there may be some that have escaped my investigations. If you are a paid up cronometer member, I've entered maca under Sana Direct Maca Lepidium Chacon. I think it's possible to share with other members and I've also submitted it to be be considered for the main database there. 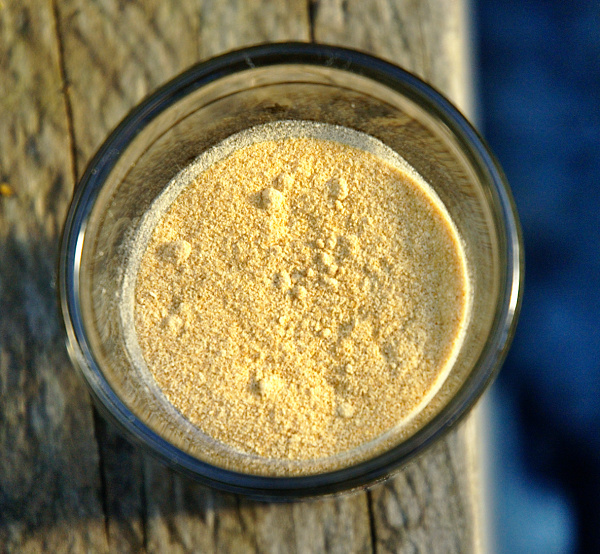 When dried, maca becomes the yellowish coloured powder you see below, just hanging out in my garden, in a Starbucks espresso measure. 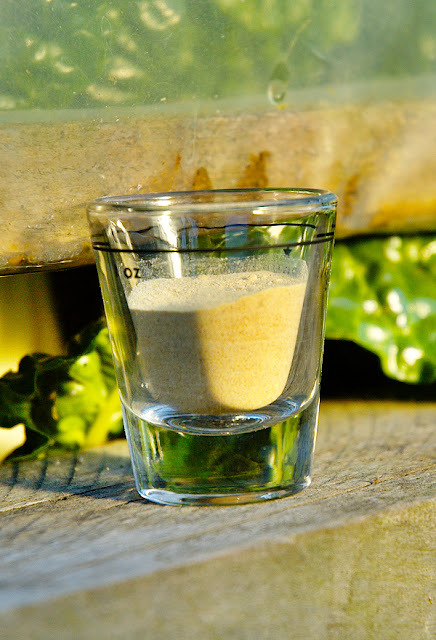 The usual consumption of maca is just 1/2 tsp, twice a day, but many people (e.g. moi) take much more than this. You can put it in things - baking, unbaking, smoothies, mix it in water, sprinkle it on breakfast. It has a unique taste that is often described as 'malty' and I've noticed that this varies a lot with processing technique. Sun-dried definitely tastes sweeter and 'maltier' than oven dried. Like many plants that grow in adverse conditions, maca is high in nutrients. The info in the table below relates to the maca that I buy for Sana Direct, which is the Peruvianum Lepidium Chacon genus (try saying that after a few wines). I'm not sure why the grower only assayed a few vitamins, but went crazy on the amino acids. The most interesting bits are the decent to high levels of sterols, vitamin C, B6, potassium, iron, copper and manganese. It's also pretty good for zinc and calcium. I have heard that maca is high in iodine, but that wasn't the case in this assay. This, of course, will vary depending on where it is grown. In the next part of the maca series, I'll be looking at some of the research around the benefits of it. Question: Do you take maca? What do you think of it? Labels: maca peruvianum lepidium chacon, maca powder, maca series, raw maca bars. I LOVE maca, great stuff!! I prefer the taste of lucuma, but maca's nutritional benefits are pretty outstanding, huh? I love lucuma too, and used to prefer it, but now maca seems to have taken over my tastebuds. I've heard that your body will instruct you to 'like' stuff that provides the nutrients it needs and there must be something like that going on. I hated maca when I first tried it. I take it and I'm pretty sure I was starting to go into menopause before I started taking it (not for menopause, but to get more energy). That was two years ago. I'm 50 now and still having regular periods. 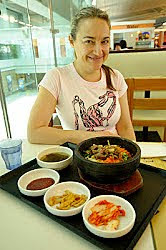 At 48, I was having signed of peri-menopause. A few weeks after I started the maca, my body started behaving like it used to and no sign of menopause. I feel like the oldest menstruating woman in the world! I can't say for sure it's the maca because at the same time I just starting living more healthy, but I think it helped. I love maca - I have recently started taking it, and, as above, the weird taste grows on you. I add it to a kefir smoothie with strawberries, a teaspoon of mesquite, and a teaspoon or two of maca. If you need to, you can add a banana too! There are some other lovely maca smoothie recipes out there, I often buy them when I'm out- and people add to brazil nut/ almond milk, hemp seed, and dates - they taste amazing. My friend swears by adding raw cocoa and maca to things - she says it gives you a lovely natural high that lasts for a few hours. She is a busy mom that doesn't get much sleep and says its a great way to get natural energy that doesn't crash you like coffee does. Thanks for the article.